One of the more remote scenic drives in Montana, the Bears Paw Mountains Backcountry Drive passes through, as the name suggests, the heart of the Bears Paw Mountains in north-central Montana. The seventy-six mile drive passes through the middle of this small but isolated mountain range that lies south of Havre and Chinook, Montana. Highlights of the trip include the Bears Paw Mountains, rolling grasslands, Beaver Creek Reservoir, Bearpaw Lake and Faber Reservoir. 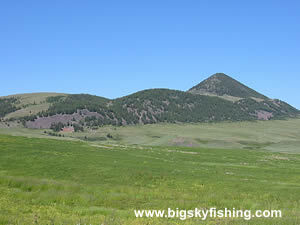 For those unfamiliar with them, the Bears Paw Mountains are Montana’s version of the Black Hills found in South Dakota. Anyone who has visited the Black Hills will find many similarities. However, unlike the Black Hills region, the Bears Paw Mountains have a greater diversity in terrain and are far more remote. The Bears Paw Mountains Backcountry Drive utilizes a number of different roads on its journey between Havre and Chinook. Forty-five miles of the scenic drive is paved, as the route follows designated Montana State Highways. The gravel portion of the drive, which runs in-between Bearpaw Lake and the tiny town of Cleveland, is generally in good condition. However, the gravel portion of the drive will be a messy and difficult ride in the event of wet or muddy roads. It’s advised to stay off this portion of the drive during the mud season or following heavy rains. Beginning in Havre, the route heads south on Montana State Highway 234, a paved road that is in good condition. The road passes through Beaver Creek County Park, a beautiful park system operated by the County. Located inside the park are Beaver Creek Reservoir and Bearpaw Lake, both of which have excellent fishing. Bearpaw Lake is also an excellent and scenic place to camp. Just south of Bearpaw Lake, the Bears Paw Mountains Backcountry Drive turns east on a gravel road called Sucker Creek Road (see this map for location of this road junction). From here, the route meanders through the rolling landscape of the Bears Paw Mountains. The topography is a mix of open meadows and grasslands in the lower elevations, with the larger hills being partially to heavily forested. As the route continues to the east, utilizing three different roads (see map below) that are easy to miss and which are usually not marked in any particular way, the landscape opens up. The valleys get bigger, the grasslands more expansive, and the forests become confined to the top of the tallest peaks. After thirty-three miles, the road reaches the town of Cleveland, which consists of a tiny school and little else. Faber Reservoir, a small reservoir located smack dab in the middle of the prairie and nestled among the smaller hills, is located just a short-drive from here. 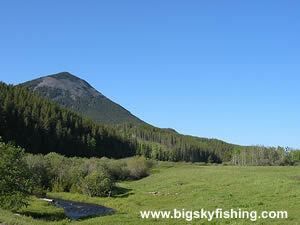 In Cleveland, the Bears Paw Mountains Backcountry Drive turns north and follows Montana Highway 240 to Chinook. The drive passes through primarily flat prairie. Along the way, the drive also passes Bear Paw Battlefield, part of the Nez Perce National Historic Park, which is where in 1877 the final battle of the Nez Perce War was fought. There is no visitor center at the battlefield. Instead, the visitor center is located in Chinook itself, at the Blaine County Museum. Overall, the Bears Paw Mountains Backcountry Drive is a wonderful drive through a portion of Montana that few people even know about, let alone visit. Additionally, for those passing down US Highway 2 on their way to Glacier National Park, this route is an excellent “scenic detour” between Havre and Chinook. Road Type : Gravel and Paved. 4wd needed? : Only when gravel roads are wet/muddy/snow covered. Season : Year-round, weather permitting. The map below shows the route and location of the Bears Paw Mountains Backcountry Drive in Central Montana. The drive takes the "scenic way" between Havre and Chinook, Montana. There are no services of any kind along the Bears Paw Mountains Backcountry Drive. However, both Chinook and Havre have everything needed to restock before heading out on this remote and isolated scenic drive. Camping areas are abundant along the drive. The best place to camp is at Bearpaw Lake or around Beaver Creek Reservoir. Additionally, the BLM owns some of the land the scenic drive passes through, allowing for primitive camping in many spots. For lodging, the only place to find hotels/motels is in Havre.